Peddlers and revelers at at the boardwalk stage! I thought it would be good to write about Eden this year. We did all the booking for the boardwalk stage and provided all the kit. 8 adult (7yrs+) bike generators (2400w in total going to the sound system). Three of the bike generators are now a new brush-less design which we will eventually convert all bikes to. Plus infill and monitors at 600w. So 4.4kw (4400watts) theoretical maximum power produced by the amplifiers but we like to have some headroom to get the best quality so we don’t push the volume in to distortion. The great thing about using high efficiency speakers is that you really don’t need a lot of power to make it loud. Any improvement in efficiency means less power required which is great news for the cyclists who get a good return for their effort! Yes it was muddy and wet but the bikes are always popular when the weather gets bad and the crowd seemed to be immune to trench foot! We run our sound system (amplifiers) from 12V-DC. Which is low voltage direct current and all the DC power is only from the bikes so the sound system was always 100% pedal powered. But some equipment needs normal domestic 240V-AC mains power like you might have at home and for that we had our solar generator which we used to supply 240V-AC power for lights, decks and laptops etc. Although this only lasted a bit over half the event because it was so cloudy! We were using on average 200w from the solar rig. We actually Plugged lights and DJ decks in to the site power after the solar ran out instead of powering everything from the bikes. I was hoping the sun would come out again and to switch between the bikes and the solar would have been more difficult than the solar and the site power. Anyway it’s only a little bit of power. I just wanted to quickly make it work without disturbing the show. Next time I’m hoping to have some wind turbines to help when there is no sun. 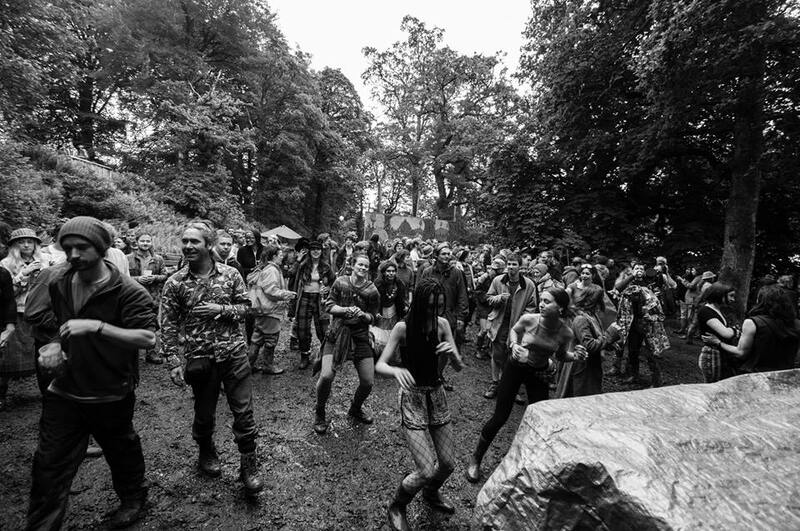 At this point I should say that for every other festival we have done the solar has been more than enough but at Eden we are open for 47 hours over the weekend with 17hours on the Saturday alone. IF we had had lighter cloud or 2.5 hours of sun on the Saturday solar would have been enough. 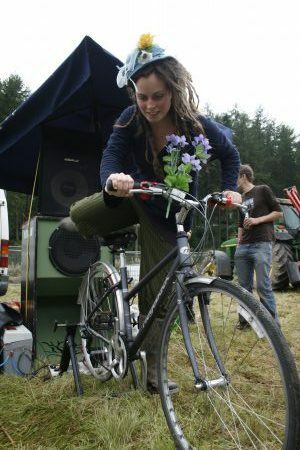 We didn’t have any backup power for the sound system and it was quite easy to keep the system going from the bikes thanks to all the cyclists. If the power level started to drop and kept dropping we would just tweak the volume of the bass a little bit to make it easier. Then give a little bit of encouragement on the mic and people get back on it. Getting the audience to cheer the cyclists is always good encouragement. It’s much more stable when just powering the sound without an inverter and with the new bikes it was really easy to get the power back up again when the power meter starts dropping. The stage is a difficult one for renewable power, being under trees (so difficult for collecting sun or wind) and quite far from the van. So we had to carry some of the equipment each night and of course to set up and take down. Plus the shear amount of hours we played for. We held a crowd of 200- 500 people most of the time. I think it would have been much busier if we had has some signs to tell the punters we were there. Lots of people said they didn’t even find us. We had more help from the festival last year but this year I think they were busy elsewhere! It’s safe to say we did our best job ever this year. The Reaction crew where totally skilled up and motivated despite the difficult conditions. We had lots of great comments from other Djs and sound people I respect saying they thought it was the best sound on site so I’m happy with that! Especially as we were the only renewable energy powered area this year. It does help sound quality being an open air stage though so maybe that’s why. We have been part of this Eden since it began and it has seen our system grow from one bike 1 bass bin. 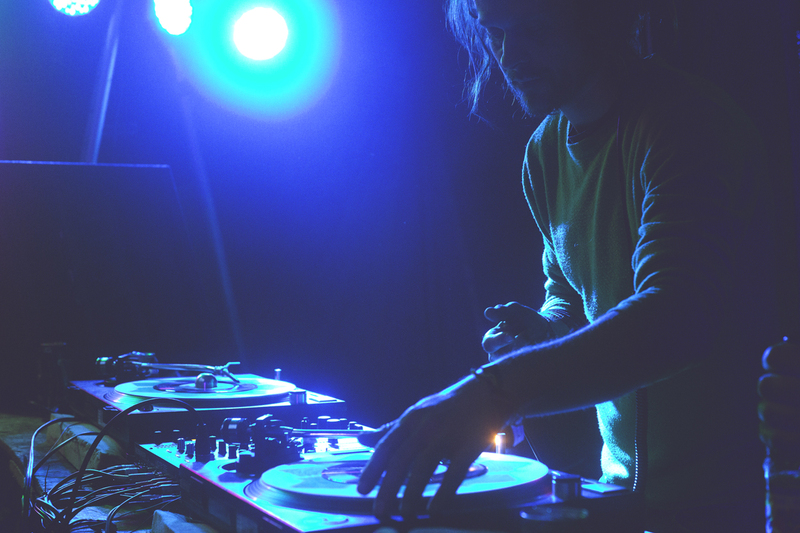 In 2009 when we started out (we were also VJing on the main stage). To 2017 when we have done our best job ever! Now we have 8 bike generators and 11 speakers. With over 30 acts playing over 47hours in the weekend. It’s not quiet (sorry to the production crew on the day shift) but we were almost always busy from the early afternoon to to the 5am end. 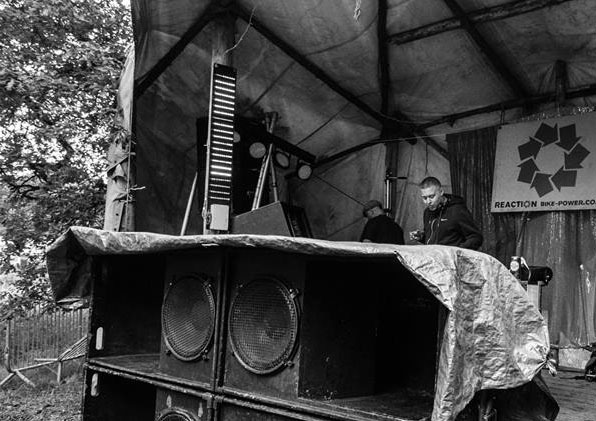 This is what happened when we put a tarpaulin over the speakers in the rain. We had it louder than this later on. The phone mic is distorting but it demonstrates the volume. 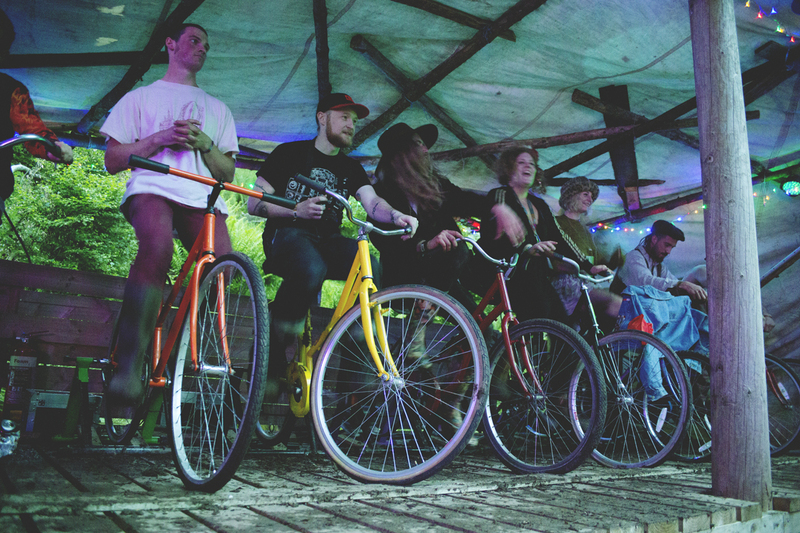 We only use the solar power for the DJ equipment and all the sound system was 100% powered by the bikes 100% of the time. Because we had more bikes it was easier to keep the power meter at the top. Thanks too to all the rest of the crew who helped make it possible. These guys were fantastic and we are so thankful for your input everyone was fantastic! Then finally to the crew and organizers of the festival who work tirelessly to ensure it all goes smoothly and it did!